The quickest, easiest stir-fry you’ll ever dream of making. The process is simple and oil-free, but the possibilities are endless for a dish this dynamic! Pair with your peanut sauce and you’ve got a real recipe for success! First thing’s first- we need to cook the chicken (If it’s not already cooked). I usually slice or butterfly the breasts and sautee or grill them. Add your soy sauce/aminos and balsamic vinegar to your veggies. Also add any spices you want (garlic powder, basil/oregano, S&P etc.). 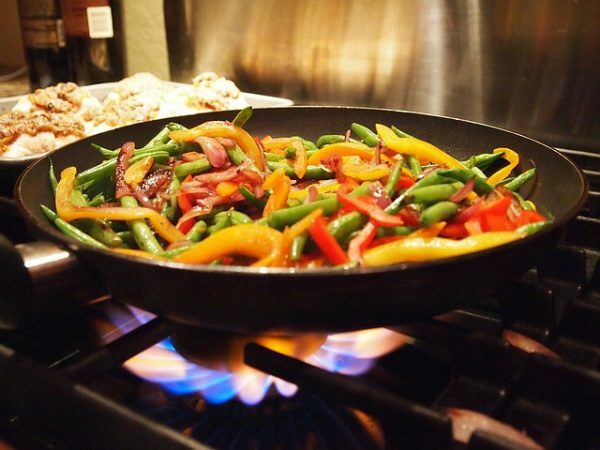 Put a lid on your fry pan to speed up cooking, but be sure to watch your water level- you don’t want your veggies burning to the bottom of the pan. Continue to add incremental amounts of water (don’t go overboard!) as it evaporates from the pan. Cook your veggies for 5-10 minutes, or until right before tender. As your veggies cook, dice up your cooked chicken. Add your cooked chicken along with your quick-cooking vegetables (like mushrooms or spinach) and Sauté 2-3 more minutes. Let your small amount of water evaporate in your pan before removing from heat. Let cool slightly before eating. **PRO TIP: Try mixing in my Bali-inspired peanut sauce instead of your regular spices!